Oil and gas processing requires the use of a specific heat transfer fluid that is designed to work to the correct temperature, with a higher flashpoint, while providing a safe solution. Global Heat Transfer technical team have worked with engineers in the oil and gas industry for many years, specifying and supplying the correct heat transfer fluidand testing and analysing the product at regular intervals throughout the year. 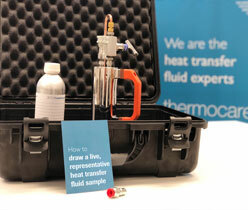 Global Heat Transfer also maintain thermal fluid for maximum operating efficiency. Heat transfer fluid systems are central to the processing of oil and gas products. Initial production, transport, refining, and recycling all require the use of heat transfer fluids. Offshore platforms use liquid phase HTFs for facility heating and regeneration of glycols that are used to remove water from the natural gas produced. Refineries use liquid phase heat transfer fluids to heat reboilers and columns for the distillation of oil and oil-based products. Companies that reprocess and recycle used oils use heat transfer fluid in very high temperature distillation facilities and pumping stations placed along oil pipelines use heat transfer systems to help control the viscosityof the oil moving through the line. Globaltherm® heat transfer fluids are widely used in the oil and gas industry because of their high temperature stability. Globaltherm® Syntec is the most popular high temperature heat transfer fluid. Primary uses are oil and gas, chemical industries, plastics processing and biodiesel applications. Globaltherm® Syntec uses the chemistry of the most popular high temperature liquid phase heat transfer fluid. No other heat transfer fluid delivers a higher degree of customer satisfaction for oil and gas processing applications. Globaltherm® Syntec is readily pumpable at temperatures as low as -3°C (27°F) insuring trouble-free start up under most conditions. Globaltherm® M delivers good viscosity, at the relevant operating temperatures, and ensures high heat transfer rates requiring limited pumping energy. The operating temperature range for Marlotherm® SH is from 250°C (482°F) to 350°C (662°F) and can be used intermittently at film temperatures as high as 380°C (716°F). Marlotherm® SH has superior thermal stress resistance in the bulk outlet temperature range from 60°C-350°C (140°F - 662°F) and primary uses are plastics processing and biodiesel industries. Globaltherm® NF is the non-fouling, non-toxic, high performance semi-synthetic heat transfer fluid specially developed for use in industrial heat transfer, including oil and gas applications. Globaltherm® NF is made from severely hydro treated synthesised hydrocarbon base stocks, and delivers exceptional thermal and oxidation stability, allowing operation at high temperatures for extended periods. It is non-hazardous, non-toxic, water white and odourless. Globaltherm® NF heat transfer fluid has a high flash/fire point and provides extra resistance to degradation, in particular the build-up of sludge.